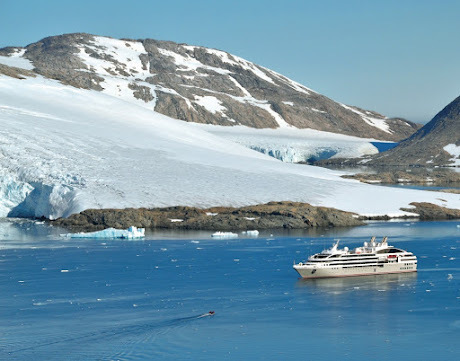 September 2015 | The only French cruise line and world leader in Polar cruising, PONANT has just completed a first in the history of navigation, as two of its sister-ships, Le Boréal and Le Soléal, have just crossed the legendary Northwest Passage from Greenland in the east to Siberia in the west. Having achieved a first for France in 2013, PONANT has pulled off a world first with two of its ships crossing the passage three days apart on the historic explorers' route via the Bellot Strait. This latest achievement is the culmination of more than 15 years' experience sailing in the Arctic and Antarctic regions. "It is with great pride that we announce this crossing under the French flag, unique in international maritime history," says Jean-Emmanuel Sauvée, Chief Executive Officer of PONANT. Captains Etienne Garcia and Patrick Marchesseau on Le Boréal and Le Soléal ensured their passengers were able to take full advantage of an extraordinary experience aboard these two luxury yachts. Designed to sail in extreme regions, each has 132 staterooms and suites and have obtained the international "CLEANSHIP" label (Bureau Veritas) for their innovative green equipments. Along the voyage through the narrow channels and shifting glaciers of this little known region, they explored historic landmarks like Beechey Island of Franklin expedition fame, Gjoa Haven where Amundsen anchored his ship over a century ago and Cape Bathurst. They also saw hundreds of belugas, around 60 bears and nearly 500 narwhals. Another highlight for passengers was meeting French adventurer Charles Hedrich, the first man to cross the Northwest Passage solo in a rowing boat. Aboard luxury yachts designed for extreme regions and small enough to venture into areas not accessible to other ships, PONANT's five-star expeditions offer an opportunity to explore the remotest regions in luxurious comfort: a unique concept where flexibility at all times is the approach with a constant respect for the environment. From sharing in th e day-to-day activities of the crew and expedition teams, comprising experts who are passionate about their subject, to having access to the Bridge and regular outings in Zodiacs in small groups, everything has been thought of to provide an experience that is as close to nature and the thrills of exploration as it is possible to be. Photo credits: Philip Plisson, iStock, Servane Roy Berton, Ponant.